Last time I wrote about Hadoop on Heroku which is on add-on from Treasure Data – this time I am going to cover NoSQL on Heroku. There are various datastore services – add-ons in Heroku terms – available from MongoDB (MongoHQ) to CouchDB (Cloudant) to Cassandra (Cassandra.io). This post is devoted to Cassandra.io. Cassandra.io is a hosted and managed Cassandra ring based on Apache Cassandra and makes it accessible via RESTful API. As of writing this article, the Cassandra.io client helper libraries are available in Java, Ruby and PHP, and there is also a Objective-C version in private beta. The libraries can be downloaded from github. I use the Java library in my tests. 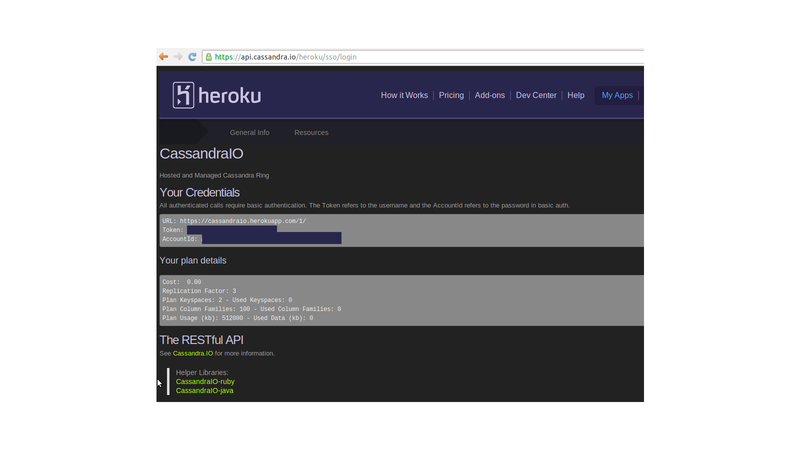 Heroku – and Cassandra.io add-on, too – is built on Amazon Elastic Compute Cloud (EC2) and it is supported in all Amazon’s locations. Note: Cassandra.io add-on is in public beta now that means you have only one option called Test available – this is free. 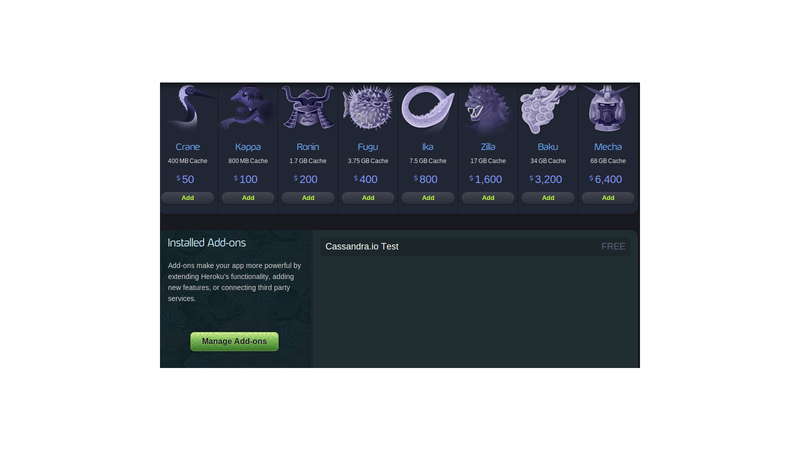 Use `heroku addons:docs cassandraio:test` to view documentation. In case of Java client library, you need Google gson library (gson-2.0.jar), too. The java RESTful API library has one simple configuration file called sdk.properties. It has very few parameters stored in it – the API url and the version. The original sdk.properties file that is cloned from github has the version wrong (v0.1), it needs to be changed to 1. You can verify the required configuration parameters using heroku config command. 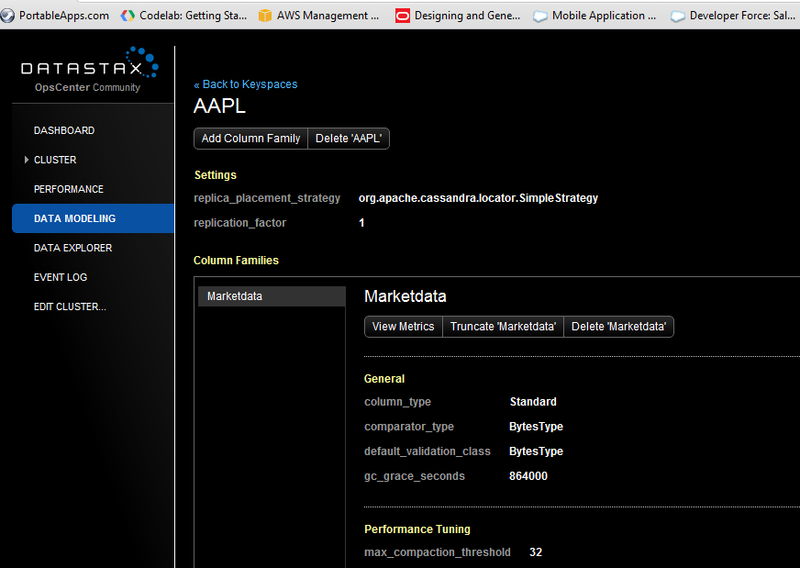 System.out.println(sm.getMessage() + " | " + sm.getDetail() + " | "
Step 2./ Then the code creates a column family called MarketData.It uses ColumnFamilyAPI – with the credentials mentioned above – and the REST url is https://api.cassandra.io/1/columnfamily/AAPL/MarketData/UTF8Type/. Step 3./ Then the code upserts the coumns called Open, Close, High, Low, Volume and AjdClose. 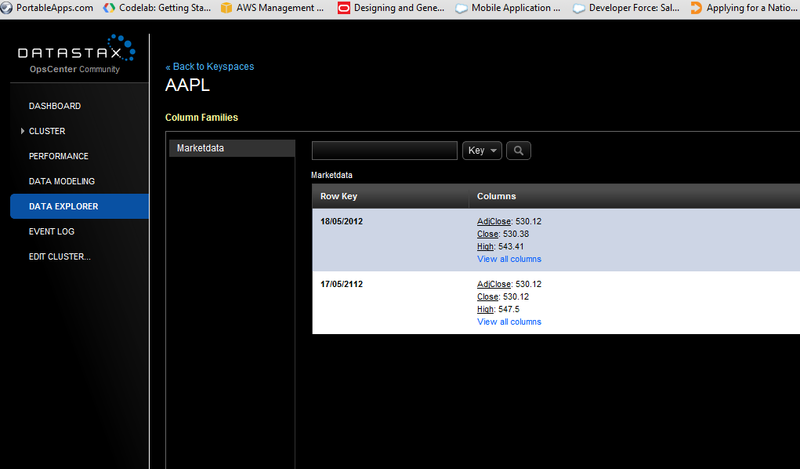 It uses ColumnAPI – same credentials as we already know – and the REST url is https://api.cassandra.io/1/column/AAPL/MarketData/Open/UTF8Type/?isIndex=true where AAPL is the keyspace, MarketData is the column family and Open is the column. Step 4./ Then the code prepares the data as name/value pairs (Open = “533.96”, Close = “530.38”, etc), defines a rowkey (“18-05-2012”) and the uses DataAPI postBulkData method to upload the data into Cassandra.io. DataAPI credentials are the same as above. Step 6./ Finally the code destroys the keyspace using HTTP DELETE, url: https://api.cassandra.io/1/keyspace/AAPL/. If you want to try out a robust, highly available Casssandra datastore without any upfront infrastructure investment and with an easy to use API, you can certainly have a closer look at Cassandra.io on Heroku. It takes only a few minutes to start up and the APIs offer a simply REST based data management for Java, Ruby and PHP developers. Keyscape: it acts as a container for data, similar to RDBMS schema. This determines the replication parameters such as replication factor and replication placement strategy as we will see it later in this post. More details on replication placement strategy can be read here. Column Familiy: within a keyscape you can have one or more column families. This is similar to tables in RDBMS world. They contain multiple columns which are referenced by row keys. Column: it is the smallest increment of data. It is a tuple having a name, a value and and a timestamp. Datastax is the commercial leader in Apache Cassandra, they offer a complete big data platform (Enterprise Edition) built on Apace Cassandra as well as a free Community Edition. This post is based on the latter one. In 2012 they were listed among the Top10 Big Data startups. Beside the Cassandra package they also offer a web-based management center (Datastax OpsCenter), this can make Cassandra cluster management much easier than the command line based alternatives (e.g. cassandra-cli). To download Datastax Community Edition, go to this link. Both the Datastax Community Server and the OpsCenter Community Edition are available in here. As of this writing, The Cassandra Community Server version is 1.1.2 (dsc-cassandra-1.1.2-bin.tar.gz) and the OpsCenter is 2.1.1 (opscenter-2.1.1-free.tar.gz). The installation is as simple as to unzip and untar the tarballs. Then you need to configure the cassandra instance by editing <Cassandra install diractory>/conf/cassandra.yaml file. My configuration had two nodes, the second node has a similar cassandra.yaml file except for the listen_address and the token. Token generation is explained in the Datastax documentation: http://www.datastax.com/docs/1.1/initialize/token_generation. Since my nodes were running on AWS EC2, I also modified the endpoint-snitch which is used to map IP addresses into datacenters and racks, see more details in here. Note: I did not want to use SSL between the agents and the OpsCenter so I disabled it. 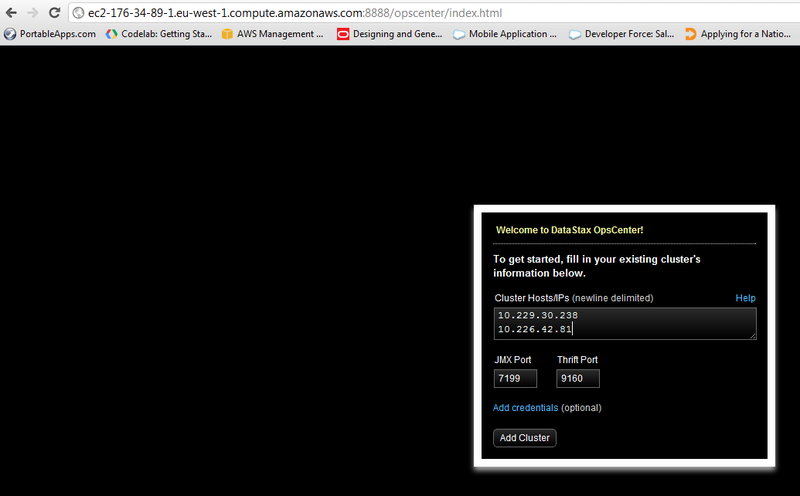 In fact, OpsCenter is a python twistd based webserver so you need to have python installed as well. Amazon AMI had python 2.6.7 preinstalled. You can also install the agents manually – that is what I did – or automatically, but you have to ensure that they are installed on every node that are members of the cluster. The agent is part of the OpsCenter tarball, it can be found under OpsCenter/agent directory. stopm_interface is the OpsCenter interface, while use_ssl: 0 indicates that we do not use SSL for agent communications. Note: Cassandra and OpsCenter are using TCP ports that are not open by default on an AWS EC2 instance. You need to defined a special security group that opens the following ports: 7000/tcp, 9160/tcp, 8888/tcp, 61210/tcp and 61621/tcp. More details about how these ports are used can be found here. The simplest way to start using Cassandra is its command line tool called cassandra-cli. These steps create a keyspace called AAPL, modify the replication parameters mentioned above (replication factor and placement strategy) and create a column family called Marketdata. Then we can use Set command to insert data and Get to retrieve them. Besides the ‘traditional command line interface’, there is also a SQLPlus-like utility known as Cassandra Query Language Shell (cqlsh). This is a utility written in python that supports SQL-like queries (a kind of Hive analogy from Hadoop world). It supports DDL and DML type of commands so you can run SELECT and INSERT statements as well as CREATE KEYSPACE, CREATE TABLE, ALTER TABLE and DROP TABLE. Connected to BigHadoop Cluster at localhost:9160. 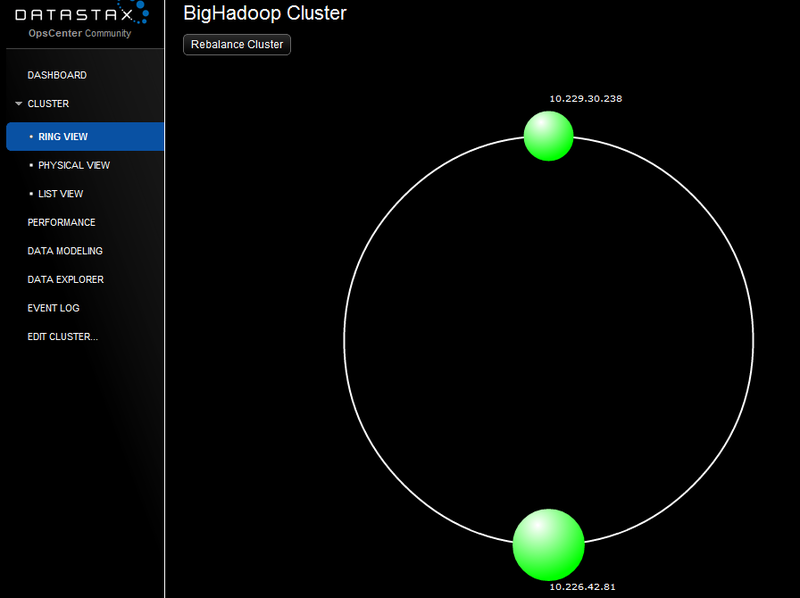 Datastax OpsCenter provides a web-based management tool to configure and monitor Cassandra clusters.